In Andhra cuisine dal is prepared almost everyday. So they have many variations to it. Different veggies or greens are added each day.. This is a recipe with spinach which is very healthy and nutritious. Tamarind juice .... 2-3 tbsps. Turmeric powder ...... 1/4 tsp. Cumin seeds .... 1 tsp. Mustard seeds ... 1 tsp. 1. Soak dal for 3-4 hours. Wash and chop the spinach leaves coarsely. 2. 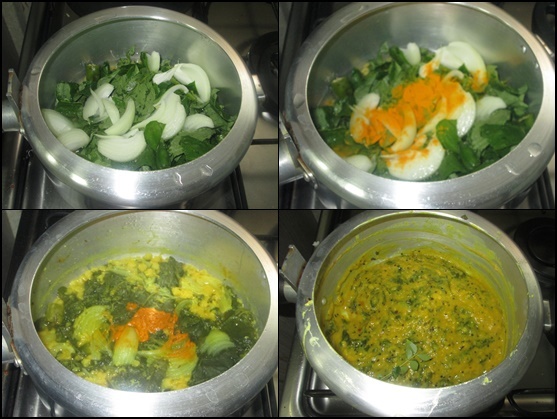 In a pressure cooker take the soaked dal, spinach , onion and green chillies. Add a little salt and turmeric powder. Add sufficient water and pressure cook it for 2-3 whistles until done. 3. Open it after the pressure is released and mash it with the spoon. Check the salt and mix the tamarind juice. 4. Heat oil in a small pan and add the tempering ingredients. When they crackle add the crushed garlic and when it turns light brown mix the tempering to the boiled spinach dal. Serve with plain rice with little ghee on top. Comfort dish,delicious and healthy dish,will surely try this. I love the palak-dal combo. Yummy and thx for linking to the event. Super comfort Dal !! Perfect with rotis and rice !! Thanks for linking to the event ! !